1 What Are Favorites and Underdogs? 2 What Are Point Spreads? 4 What Are Over/Under Bets? 5 What Is a Parlay? 6 Where Can I Place a Bet? 7 Can I Get Help with My Bets? A year ago, the only way you could legally bet on the outcome of sporting events was by taking a trip to Las Vegas and doing it in person. It was illegal to bet on sports in every other state in the U.S. except for Nevada. But in June 2018, Delaware and New Jersey made the move to legalize sports betting. Since then, six other states, including Pennsylvania, Rhode Island, and Mississippi, have joined them. And more states are expected to join the party soon, too. As a result, many Americans are learning how to bet on sports right now and taking full advantage of having the opportunity to do it. They’re placing bets on NFL games, NBA games, and so much more. If you want to join them, it’s important to know how to bet on sports first. Here are things to know before placing your first bet. What Are Favorites and Underdogs? The first thing you should make sure you understand when you’re trying to learn how to bet on sports is the difference between favorites and underdogs. Fortunately, it’s a pretty simple concept to understand. The favorite in any sporting event is the team that’s expected to win the contest. Often times, this will be the team with the better overall record or the team that’s playing a game at home since home teams typically tend to be favored in close matchups. The underdog, on the other hand, is the team that’s expected to lose the contest. They may not have the talent that the favorite has or they might just be playing on the road in a tough environment, which makes them the underdog. There are some instances in which a team that you might think would be the favorite in a contest would actually be an underdog. For example, if a team is playing without its best player due to injury or if they’re playing their third game in four nights and resting several players, the people in charge of determining the favorite for a contest might make them the underdogs. But generally speaking, the favorite will be the stronger team of the two teams taking part in an athletic competition. Most people are able to wrap their heads around the favorite versus underdog concept without any trouble. But they have a harder time understanding what point spreads are and how they work. Point spreads are designed to let bettors know how big of a favorite one team is over their opponents. Each favorite and underdog is given a number that represents how much bookmakers expect them to win or lose a game by. For example, let’s say that the New York Giants are playing a game at home and considered a 6-point favorite over the visiting Philadelphia Eagles. This means that the Giants are expected to beat the Eagles by about 6 points in the game. If you were to place a bet on this game using the point spread, you would either have to bet on the Giants to beat the Eagles by more than 6 points or bet on the Eagles to lose the game by under 6 points. It forces bettors to do more than just pick a side in a game; they also need to consider the point spread. Not everyone loves using the point spreads when betting on games. Some people struggle to understand them, while others just don’t like the idea of losing a bet when the team they picked to win wins their game without covering the spread. Moneyline bets are a better option for these people. They make betting on the outcome of sporting events much simpler. When you place a moneyline bet, the only thing you need to worry about is picking one team or the other to win the game. So using the example above, you would have to pick either the Giants or Eagles to win their game–and you would collect money if you correctly select the team that is victorious. One thing to keep in mind when it comes to moneyline bets, though, is that you’ll get different odds than you would with point spreads. If you place a bet on a favorite, you’ll usually get much shorter odds that won’t net you much of a return on a win. If, for example, you bet on the Giants, your odds might be something like -245, which means you would need to bet $245 on the Giants to win just $100. Your odds will be much longer when you bet on underdogs in moneyline bets. A bet on the underdog Eagles could get you odds in the neighborhood of +220, which would mean you would only need to bet $100 to win $220. But the Eagles would obviously need to upset the Giants on the road for you to collect that kind of money. Moneyline bets are great for those who just want to root for one team or the other to win. But the odds that come attached to them can put bettors at a disadvantage over the long run. In addition to betting on which teams will win games, you can also bet on what the final score of games will be. These are called over/under bets because they call on you to try and correctly predict whether a game will go over or under a total score set before the game begins. Outside of determining that the Giants are a 6-point favorite over the Eagles, bookmakers will also come up with the total prior to the game. If the Giants and Eagles both have great offenses that can put up a lot of points, the total might be something like 49. Those who make over/under bets will have to bet on the total score for the game going either over or under 49. A 21-13 Giants win would be a winning wager for those who bet the under, while a 34-31 Eagles win would be a winner for anyone who bet the over. When you make over/under bets, it doesn’t matter which team wins. All that matters is what the final score is in relation to the over/under total that was set at the start of the contest. If you’re feeling especially lucky when you start betting on sports, you might want to try your hand at making parlay bets. Parlay bets are bets that combine several bets into one bet with long odds. For instance, let’s say that you want to bet that the Giants will beat the Eagles by more than 6 points. But you also want to bet that the Dallas Cowboys will beat the Washington Redskins by more than 2 points and that the Seattle Seahawks will beat the Cleveland Browns by more than 10 points. You can put in a parlay bet that calls for the Giants, Cowboys, and Seahawks to each win their games by more than the point spread (or the moneyline, if you don’t want to worry about the point spreads!). If all three teams win, you’ll win approximately 6.5 times your original bet. So if your bet was $100 on those three teams to all win, you’ll walk away with about $650 plus your original $100. Parlays are a nice way to maximize your profits if you’re feeling confident about several bets at once. As we mentioned earlier, the only way you used to be able to place a bet on sports was by getting on a plane and flying to Las Vegas to do it. Outside of doing that, your only other option would have been to place a bet illegally through an offshore sportsbook. Today, there are many states that offer alternate options. People can walk into any casino in states like New Jersey, Delaware, and Pennsylvania and place a bet. But they can also place bets online through sportsbook that have been set up by reputable sports betting establishments. Check to see which options you have in your specific state before placing a bet. Can I Get Help with My Bets? Figuring out how to bet on sports is simple enough. But figuring out how to pick winning teams consistently while you do it? That’s another! Fortunately, there are places you can turn to get helpful tips and betting strategies. There are lots of so-called “cappers” (short for handicappers) who can help you make bets on sporting events with total confidence. Learn more about them and put them to good use if you’re having a hard time making winning picks. The average American is still learning how to bet on sports right now. People haven’t been exposed to sports betting enough just yet, so there’s a slight learning curve associated with it. But the great thing is that it’s actually a ton of fun to learn how to bet on sports. 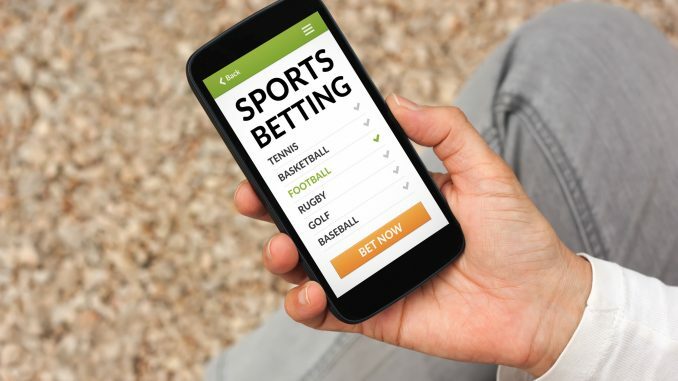 You’ll have a ball finding out the differences between the types of bets and learn everything you’ll need to know about sports betting sooner than later. Read our blog to check out some of the best online casinos that are out there right now.